I had a hard time with the title of this post. I don’t think there is a dish named for what goes in the bowl, so I made one up myself. Spicy sweet and sour Thai sauce + Mahi Mahi + spaghetti + Shimeji mushrooms + lotus roots; it has elements of Thai, Italian, Japanese, Chinese. 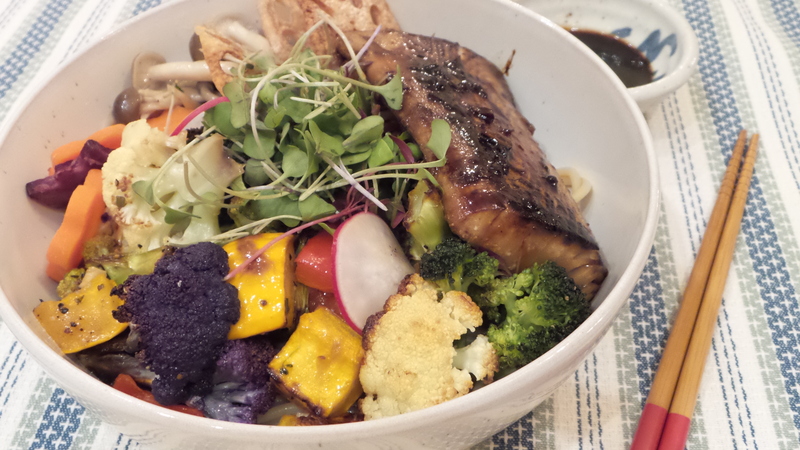 I decided to call it the Pan-seared Mahi Mahi Fusion Bowl. Or should it be Rainbow Bowl? I love the colors! Remove skin of lotus root with a peeler. Cut into 1/8″ inch slices. Drizzle the olive oil over the slices and fry in air fryer until crispy. Alternatively, deep fry the lotus root or air bake in the oven. Prepare spaghetti according to package instructions and set aside. Arrange mahi mahi in a flat-base pan and coat both sides of the fish slices with the cooled marinade. Marinade for at least 10 mins. Stir fry Shijemi mushrooms with a tablespoon of oil until cooked. Set aside. When oil is hot, arrange seasoned mahi mahi in a single layer in the wok. Allow the fish to fry for 2 minutes without flipping it, this allows the bottom of the fish to be browned and seared. Flip the fish slices over and sear the other side for another two minutes. Scoop noodles into serving bowl, drizzle 1 tablespoon of sauce over the noodles. 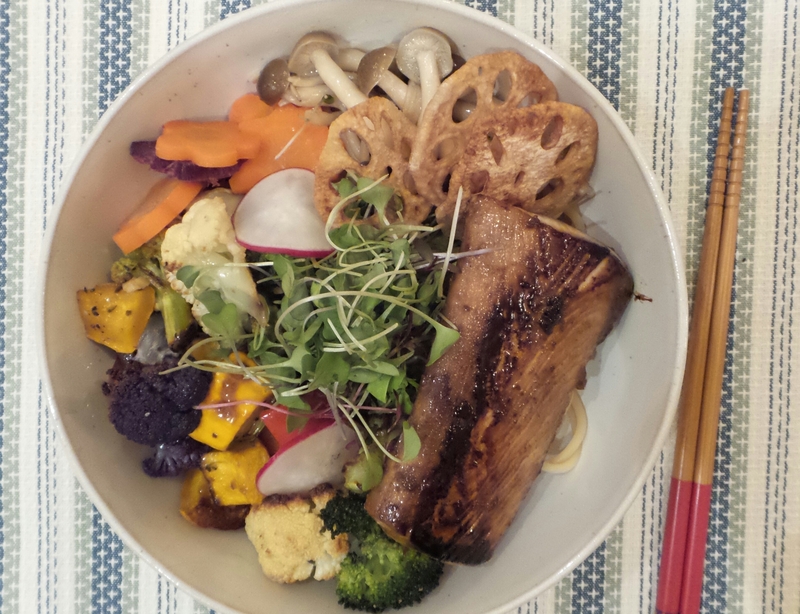 Arrange the mahi mahi, oven roasted vegetables, mushroom, and lotus root chips over the noodles. Garnish with microgreens. 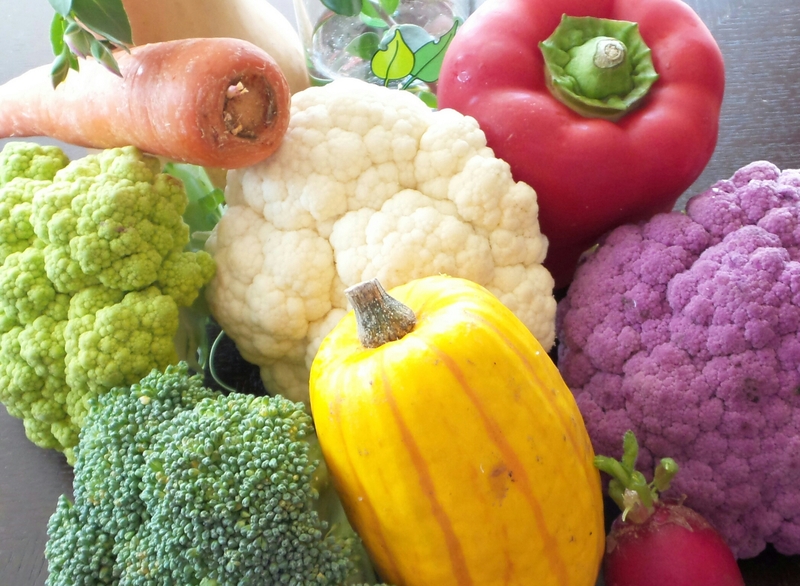 The wonders of vegetables, they actually come in rainbow colors!